This year Valley Hill Nurseries is celebrating its 40th Anniversary. It’s hard to believe how time flies. 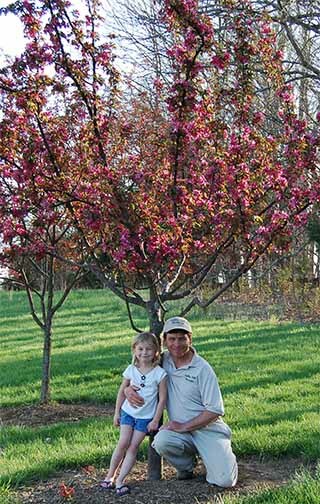 I was 10 years old when Mom and Dad pulled up stakes in Michigan and headed south to Kentucky to start a nursery. I’m awfully thankful for the 12 years I had working with Dad before his passing in 1998. I’m also thankful for all the good people we’ve worked with and friends we’ve made along the way. There is something unique and special about growing trees. About a year ago we supplied some large trees to a project in Louisville’s waterfront park. They were going into the landscape around the Lincoln Memorial there in the park. One evening my family and I were walking in the park and we stumbled upon the memorial. As we were studying the exhibit, I realized the majority of the trees around the exhibit came from our farm. You see, these were old trees planted some 15 years ago by my dad – trees my dad and I planted. Dad had purchased the trees from friends of ours in Oregon. They were moved to Louisville by a landscaper friend, and were now maintained by a college buddy who runs the park. You see, those trees make a lifetime of memories. Now my children, for the rest of their lives, can see the trees their father and grandfather planted.